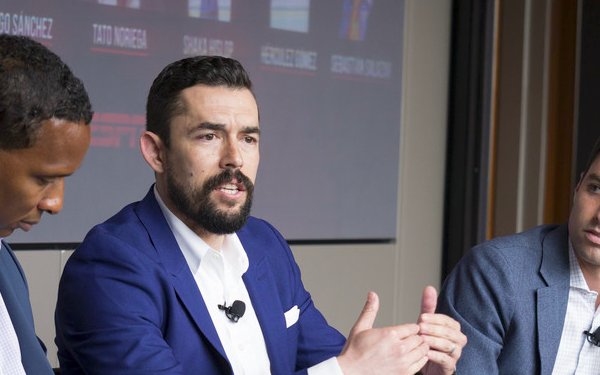 A year and a half ago, Herculez Gomez ended a long playing career to work full-time as an analyst for ESPN. Gomez works game telecasts, appears in studio segments, and co-hosts the “Herc and Max Podcast” with Max Bretos. Gomez, 36, is of Mexican-American heritage. He grew up in Las Vegas and after unsuccessful trials with three Mexican teams he landed a spot with the minor-league San Diego Gauchos, where he was spotted by the LA Galaxy and signed to a contract in 2002. He scored 18 goals for the Galaxy in all competitions as it won the MLS Cup and U.S. Open Cup double in 2005. He was called up by the U.S. national team, for which he scored six goals in 24 appearances from 2007 to 2013 and went to the 2010 World Cup. With his career at a crossroads after the 2009 MLS season, he declined an offer from Kansas City to start a career in Mexico, where he played for six teams from 2010 to 2015. He returned to finish his MLS career in Toronto and Seattle, where he’d played on loan from the Galaxy during the Sounders’ days in the old A-League. 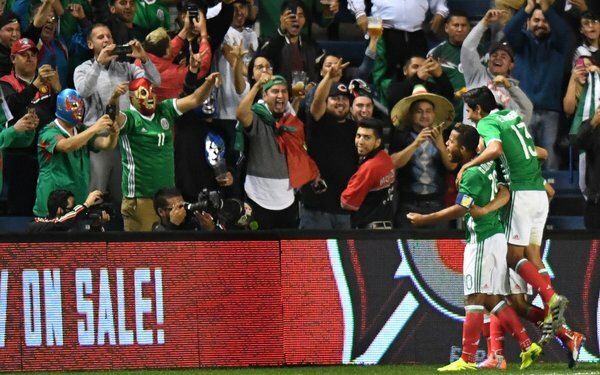 He talked with Soccer America about making the transition from player to broadcaster, how MLS compares to Liga MX on the player front and what he expects from El Tri at the World Cup. Deciding to leave MLS and take a new course in Liga MX. I was 27 years old and Kansas City offered me a four-year deal for $70,000 per year and the most I ever made in MLS was $52,000. I thought to myself, ‘I’m not going to do this again.’ My first couple of years in L.A. I made $800-something per month gross. I’m not going to do this to myself. I said no, out of frustration and spite. And out of nowhere this opportunity with Puebla came around. It completely changed my life. It opened my eyes and opened doors in a different type of world for me. About that time, I started to realize how small a window I had and I was very proactive in my decisions. I was representing myself in Mexico at the time and was very conscious that this contract could be the last one and it was my intent to come back to the States and set something up for myself, but it was never TV, never the media, never the press. During the run of games with the Seattle Sounders in the Concacaf Champions League when I was with Santos, I ran into [sporting director] Chris Henderson, and I had known Henderson for a while. I had played with his brother [Sean Henderson] while I was with the Sounders in the A-League for a few months, and we got to talking. Choosing a different path to stay involved in the game. Fast forward a few years ago and I had gotten phone calls from anybody and everybody who wanted to put a team in Las Vegas. Three different groups of businessmen had ventures to put an MLS team, or a team in the NASL or USL, in Las Vegas, and they offered me everything from a coaching position to GM to president to part-owner. That was in the back of my mind and kind of snowballed. I came back to MLS with Toronto and we got knocked out of the playoffs by Montreal. I was invited by MLS to work a playoff-preview show for them and my agent Rich Motzkin said, ‘Try it. You might like it.’ And I did. That led to an opportunity with Fox Sports and the Copa America coverage that I did, which led to an interview with ESPN, and that blossomed into this. I felt very fortunate. Not many of us can go out on our own terms. I could have kept playing and kept moving around and the next situation might not have been as good as the Seattle situation. This was a good opportunity at the right time and something I thought I could get into. It’s fun and it’s as close as I’ll ever get to playing the game again. But it was a very calculated move. I knew I couldn’t play forever. MLS teams using increased resources to attract players that are also sought by Liga MX clubs. You can see some crossover, especially with MLS, in how they are trying to go for players. That was the Mexican model: go for young, South American players who are eager to come over for a much bigger paycheck than they were getting at home and who are very good players. The club can exploit those players and if it gets a good offer sell them. Enner Valencia came to Pachuca, won the [Liga MX] Golden Boot, went to the World Cup and scored three goals [for Ecuador], and landed a huge contract with West Ham. You’re seeing MLS team chase the same type of players. Sebastian Blanco at Portland, he was a Club America target. Dario Benedetto was a Portland target; Tijuana got him and now he’s at Boca Juniors. The differences between the financial resources available to teams in MLS and Liga MX, and why teams like Portland are successful and others like San Jose and Colorado are usually struggling. Example: The Quakes tried to get Diego Valeri but he went to the Timbers instead. There are many teams in Mexican soccer that don’t have the funds of the big teams. I would argue that the majority, if not all the teams, in Major League Soccer have the funds. Some choose to use that money, others don’t. The new injection of TAM money can be used by anybody. Down south, it’s different. A lot of ownership groups don’t have that money, and some of them can’t even pay their players on time. So it’s a big difference. Diego Valeri did wonders for the Portland franchise, but who’s to say if he would have gone to the San Jose culture and environment it would have been the same? To me, San Jose has wasted one of the best generational talents of our team in this league: Chris Wondolowski. All those goals have gotten you how many playoff wins, how many championships? That’s just bad management, bad scouting. Why can’t San Jose be FC Dallas? Ridge, you’re from that area. If you’re telling me there is no talent pool in that area when it comes to youth development, I don’t believe it. They could easily be another FC Dallas. To me that is organization, that is front office, that is scouting, that is all those things that they have failed to do. Here’s what it is. Look at Seattle. Hires Sigi Schmid -- one of the winningest coaches all-time in Major League Soccer -- at the helm. You know he’s been there and done that and he kick-starts the organization. Look at LAFC. Bob Bradley, [technical director] John Thorrington. They know what it’s like and they know how to win in this league. There’s a big difference if you’re trying to jump-start an organization. If you don’t have the talent pool … so maybe Colorado doesn’t have the talent pool when it comes to youth development. Okay, that could be something. But there is no reason they should have a no-name coach and no-name players playing the way they do. They’ve spent plenty of money on that roster and you look through 1 through 20-something, you don’t know half the names and these guys are making some pretty good coin. And you see the product on the field. When you go about things in the right way in this league, because of the resources that you have, you can be successful. Photo: ISI Photos, courtesy of San Jose Earthquakes. Evaluating the class of players MLS is able to attract with the Designated-Player option and various forms of Targeted Allocation Money. Well, I think MLS has been very savvy in the players they’ve gone for as of late and it’s not just Latin America. You can look all over Europe and unless you’re playing in a big league or are a great player on a team in a big league, you’re not going to be paid that much. For the average player who’s just trying to make his way it can be very tough. Spain has tons of money problems. I won’t speak for any other country but I know for a fact that players who had the opportunity to play in Spain went elsewhere because the money wasn’t so great. You can make more in other places even if the league was better. These issues come up all the time. These players are human beings. They have families, they have obligations, they have responsibilities. If you can’t meet those obligations and responsibilities because the team didn’t hold up its end of the bargain, hey, you have to get paid somewhere, somehow. The furor of the U.S. Soccer presidential election seemingly dissipating. It almost seems we went through all this nasty, backdoor fighting we got to see when the curtain got pulled back at election time, and it was all for naught. It doesn’t seem like we’re going in a direction where something will change. I hope I am wrong. I hope that the GM comes in and has more power than we’ve heard, and has the power to change things from the grassroots level to the full national team, who has the ability to choose his own coach and coaching staff and implement his own vision. We have talented players coming through the pipeline. We have resources to see those players through. We have a domestic league that is past adolescent stage. We are in a region that is more respected around the world -- maybe not because what we are going -- because our southern neighbor has put it on the map. It worries me that all our eggs are in one basket and if we don’t get that World Cup bid, where does it leave Carlos Cordeiro, where does it leave the federation, where does it leave the kids in the pipeline, where does it leave the millions who are not underneath the umbrella? There are kids who love the sport and appreciate the sport and may not be fans of the U.S. national team but are American. The saga of Monterrey midfielder Jonathan Gonzalez, who left the U.S. programs after playing for youth teams to commit his allegiance to Mexico, the native country of his parents. [Director of national teams] Dennis te Kloese and [head coach] Juan Carlos Osorio were very clear with him. From everything I’ve heard from Jonathan’s family, from the [Mexican] federation, from individuals in various interviews, they were very clear with him. Jonathan will tell you; they didn’t promise him anything. He knew the possibility of this World Cup was remote. He’s in the process for the next World Cup. When you hear Juan Carlos Osorio talk it seems clear it was never about this World Cup. It was about the future and what he wanted to do, and he made a very personal, intimate choice to represent the Mexican national team. We can go on and get into the factors of why he did that, what happened that led him to make that decision. We’ve gone through it many times but at the end of the day he made that decision and I think it’s a decision he and his family are still very content with. To be quite honest, this kid is already one of the most prominent defensive midfielders in Liga MX. He’s being sought by Chivas, where his old coach is now the head coach. This kid has a lot going for him. I’m disappointed he won’t be wearing stars and stripes but maybe other kids in this country who are dual citizens will choose to represent other countries. It’s a very personal, intimate choice and one we must respect. Whether Mexico can make it out of a World Cup group that also includes Germany, Sweden and South Korea. Hooo, it will be difficult. They are experiencing injury concerns. [Nestor] Araujo is already out. The captain, Andres Guardado, is still an unknown. You have centerback Hector Moreno an unknown because of injury. Diego Reyes is coming off an injury. You have the Giovani dos Santos situation. Are his best years behind him? That is a major controversy at the moment. You have all these questions about the Mexican national team, but it is the Mexican national team. Along with Brazil and Germany it is the only team to get out of the group stage in every World Cup since 1994, I believe. It is a very good team, a very good program, that has been counted out before and made it out of tougher groups. My money is on Mexico advancing in second place, ultimately based on goal differential. And that means it will face Brazil in the [round of 16]. That’s not where you want to be for any national team, but Brazil will not have Dani Alves and there’s a chance Neymar will not be 100 percent. Nobody has taken on that job. If he’s not 100 percent, I say give me Brazil. But Mexico has been so Jekyll and Hyde really it won’t surprise me to see anything happen with this team. The Mexican national team players he sees now compared to those of the past. They were more disciplined tactically. They were fitter. They did different things off the field to maintain that fitness. There was a different type of mentality. This new generation of Mexican players, they have all those things in place. The Mexican national team has all the athletes’ performance -- I think they’re called athos now -- factors just like the U.S. national team or the German national team. They have borrowed methods from the around the world to complement their technical ability. How the major nations will fare in Russia and which nation will lift the trophy. There are five nations in this World Cup that have won the World Cup. France has a generation of fabulous players. Argentina is Lionel Messi-dependent. Germany is a machine. Spain has an unreal technical generation. And then there’s Brazil. In the simulator I did, I have Germany beating France in the final. I think the German team is just too deep. They are a well-oiled machine. You saw what the Confederations Cup team did and that was a ‘C’ team at best. Many of those players were on the team at the U-21 Euros and they won that final as well. This is just a very deep program and you will be hard-pressed to find a better national team at the moment. How his perspective on life has changed since becoming a father. My wife [Elsie] was pregnant for the first time in Toronto and we ended up losing the baby. [The pregnancy] was pretty far along and we were both devastated. It affected me physically, mentally, whatnot. You go along and wait for the time and when it finally comes, you’re just amazed. My baby girl, Gianna, is eight months old. It’s amazing to see the family we’ve created, the home that we’ve created. Every single day my wife and I do everything for our daughter and it brings such immense joy. I see the way she experiences things. I see the world through her eyes. It’s indescribable. I don’t have to tell you. You know how it is. It’s a very unique experience that I am so fortunate to have. 1 comment about "Herculez Gomez: 'I knew I couldn't play forever'". Ginger Peeler, June 7, 2018 at 2:01 p.m.
What an outstanding interview from the player”s perspective! Thank you, Ridge and Herculez! I especially found his respectful concerns for the US Soccer Association’s going forward following the elections to be enlightening...and in sync with some of our regular commenters’ worries. Let us hope that those concerns turn out to be baseless and that things work out well.